Stamping Sue Style: Summer Blooms ! Hopefully it's sizzling June....when beautiful blooms burst into life. Whether they're stamped, stencilled or handmade we want to see flowers as the main focus of your mixed media project. This journal page started with some dabbling with the Prima watercolour paints. 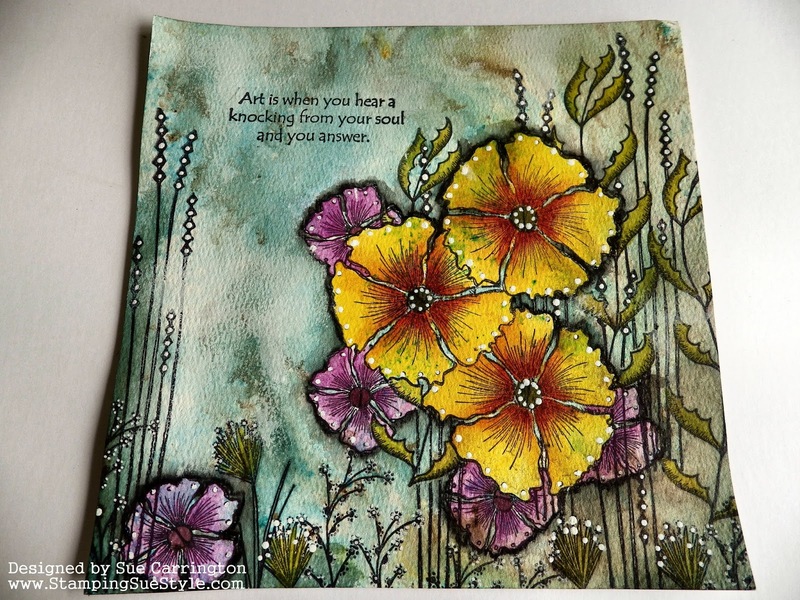 I then did lots of masking and stamping to create the garden for the main blooms, which are from Darcy Wilkinson's EDY18 stamp set. The pape I'm using is a Prima watercolour pad so has some texture to it. 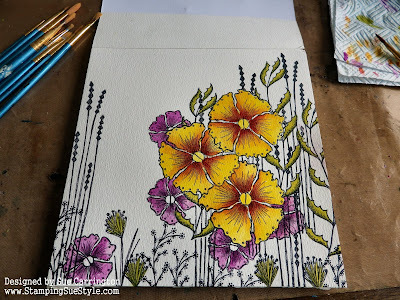 I carried on watercolouring and adding some depth to the main flowers. Then colour to the rest of the flowers and the leaves and grasses. 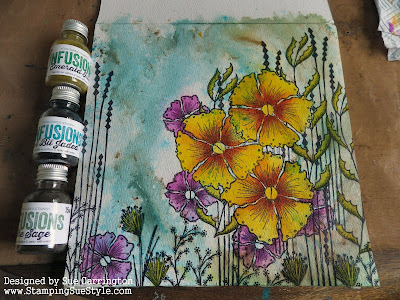 I wanted to include Infusions on this page so I misted the page with water then carefully sprinkled the powders on the page. 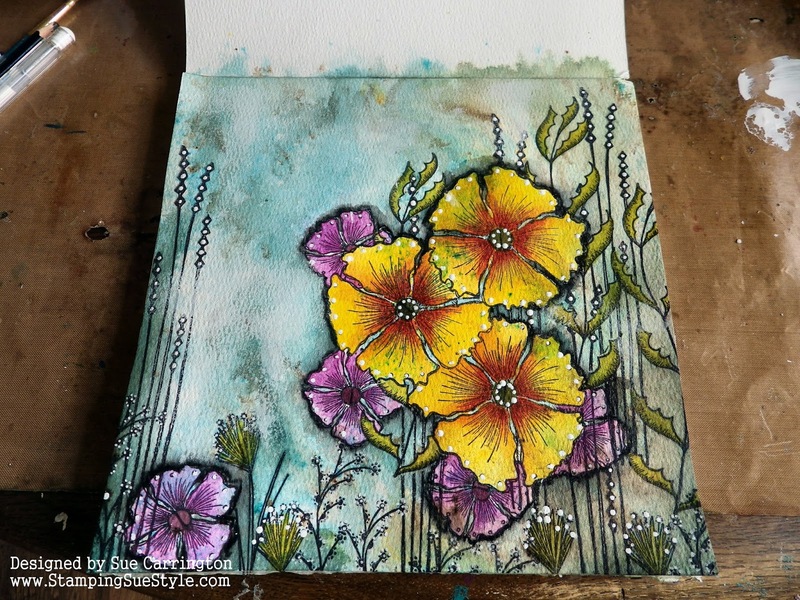 The colour leaked over the main flowers but I quite liked the watercolour effect. To fill in the white areas around the flowers I used the Infusions as a watercolour. I also added more colour around the edges using the Infusions in this way too. The little white dots are done using the end of a paintbrush dipped in Snowflake Fresco Finish paint. I still wanted the main flowers to pop a little more so I used a black Stabilo pencil and damp paintbrush to add a shadow. 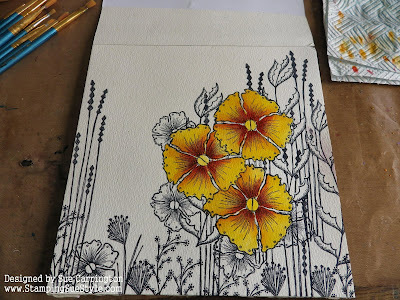 A close up of the flowers, the centres were painted with black Infusion powder mixed with water. Love how the walnut stain of the Infusions has come out in areas creating the variation of colour. 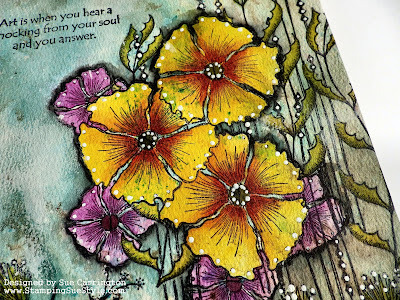 The sentiment is also from a Darcy Wilkinson stamp set, EDY12, one of my favourites ! This page turned our better than I thought, I really love the Infusions effect and watercolouring with them is fabulous too. This is so beautiful Sue. 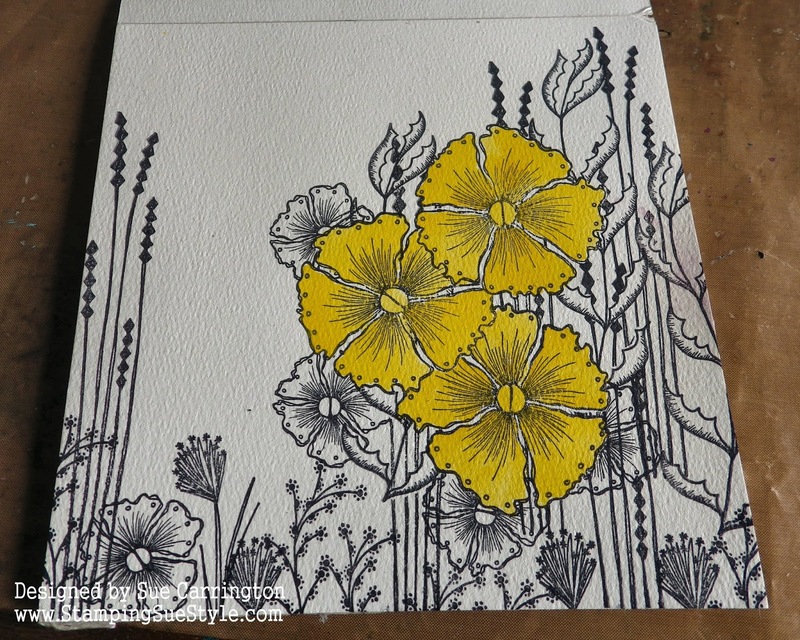 Those gorgeous bright flowers really do jump off the subtle colours of your background. 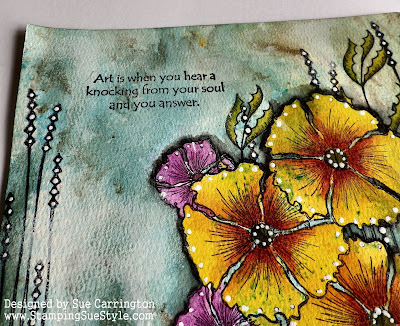 Totally love this page Sue! Such beautifully coloured flowers and fabulous Infusions background. 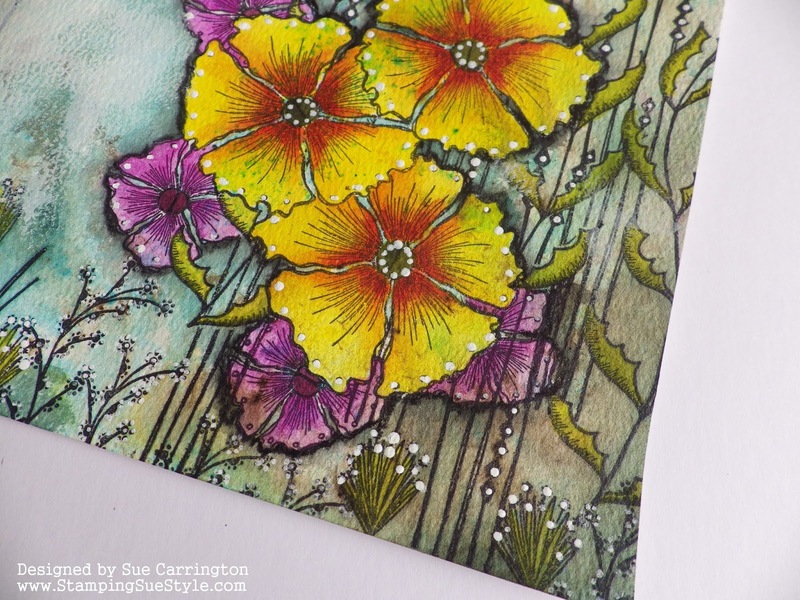 Stunning colouring on the flowers giving them such depth and a beautiful glow - just perfect for the Floral Frenzy!